Cigarette smoke does waft on the breeze so No Smoking Within 50 Feet Of Mall Entrance please. In this locale in particular, many Mall entrances are tucked into alcoves and building recesses which block the wind and amplify any smoke smell. So take a short stroll and give non-smokers a bit of space. As a former smoker I wish I could join you, but must stay back with the non-smokers for my own good. 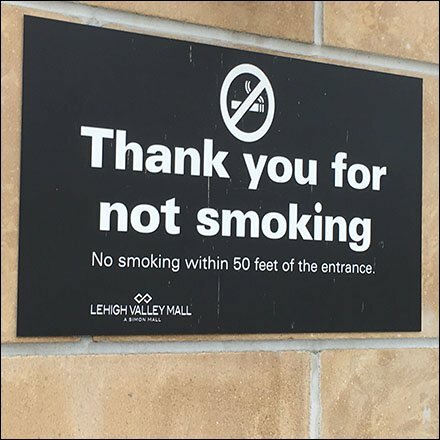 This No Smoking Within 50 Feet Of Mall Entrance restriction seen at the Lehigh Valley Mall, a Simon Property.